It takes a lot of energy to run a university and the U of S is committed to managing energy consumption efficiently, wisely and responsibly. On October 9, 2014, the university's Board of Governors approved the Energy and Water Conservation Policy. In 2012/13 we consumed 29,750,000 m3 of natural gas and 132,000,000 kWh of electricity. That's roughly the natural gas and electricity used by 12,000 Canadian homes1. The Central Heating & Cooling plant burns natural gas to generate steam which is used for heating, research processes, heating swimming pools and domestic hot water. In summer, the plant uses electricity to chill water to provide air conditioning across campus. Learn what you can do at school, work or home to conserve energy. 1 Based on data from Statistics Canada, Households and the Environment: Energy Use, 2011. The University of Saskatchewan is home to a wide variety of buildings that run the gamut of sizes and uses. Energy use intensity (EUI, measured in terms of building energy use/unit area of building floor space/year) allows for comparison of the energy consumed in buildings of different sizes. This helps us account for how certain types of buildings use more energy than others (for example, an office building or elementary school uses relatively little energy compared to a hospital). In Canada, food service buildings, grocery stores and hospitals have the highest EUIs. Similarly, on campus certain activities lead to higher rates of energy use. The figure below shows the EUIs of campus building types relative to each other. Lab buildings typically require much more ventilation, which consumes more heat (from steam) and electricity (to run large fan motors). Equipment other than the office equipment and lighting found in all academic and administrative buildings, accounts for some of the additional electrical use in lab buildings. Providing food for tens of thousands of people on campus uses a lot of energy. The Sustainability Revolving Fund is currently taking applications for energy and water conservation projects. Once approved these projects will start saving energy, water and reduce utility costs. Lighting retrofits have been taking place on campus for many years now, with last calculated savings in 2015 being estimated at 17,893 Gj/yr of electricity or more than $250,000. These retrofits largely involve the replacement of magnetic ballast incandescent or compact fluorescent fixtures with more energy efficient electronic ballasts and LED bulbs. In addition to conserving energy, these measures improve lighting quality. The energy saved by the retrofits (as of 2015 estimates) reduces our greenhouse gas emissions by an estimated 4,240,000 kg CO2/yr, an amount roughly equivalent to taking 656 cars and light trucks off the road in Saskatchewan. The University is currently investigating options for transitioning its outdoor lighting systems to LED equivalents. In the summer of 2016 a solar panel installation was erected on the south end of the John Mitchell Building. These panels are the result of a Living Lab student project which sought to expand renewable energy generation on campus to increase the availability of experiential learning opportunities. 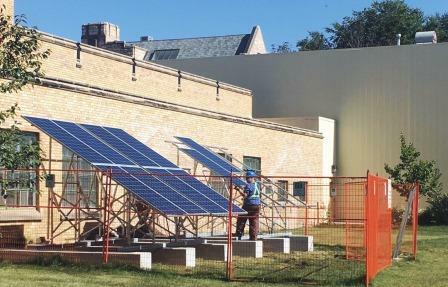 The panels are overseen by student volunteers from the U of S Innovative Energy Team and they are currently being used as hands-on study aids for a number of classes in the College of Engineering. The installation of a 24-kilowatt solar panel system at the Horticulture Science Field Facility (located south of the main campus on 14th Street) was one step to fulfilling the university's commitment to reducing its greenhouse gas emissions. The array will supply about 70% of the horticulture facility's electricity each year, about the same as it takes to power 3.7 homes for a year. Since 2008, Parking and Transportation Services has been installing controllers in campus parking lots to regulate electricity flowing to the vehicle plug-ins based on outdoor temperatures. So far audits show a 46% savings on the energy costs associated with plugging in cars on campus. Maintenance costs have also gone down thanks to the automated features of the devices.